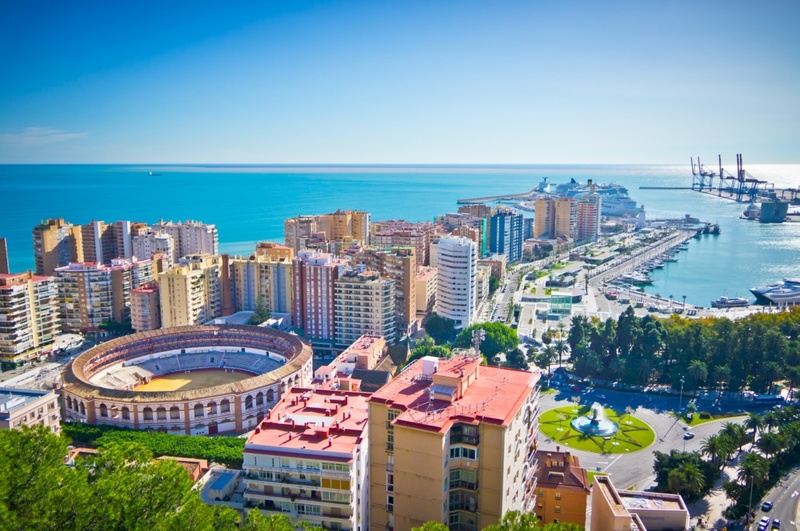 Malaga is often called the capital of Costa del Sol, and its historical buildings, quirky museums and high-quality beaches attract thousands of tourists every year. Fascinating monuments from Roman and Moorish times through to today lay surrounded by atmospheric streets, bustling tapas bars and lively discotheques, making Malaga a destination you will never forget. With its nearly six hundred thousand inhabitants, Malaga is the sixth largest city in Spain and the second in Andalusia after Seville. It was founded as Malaka by the Phoenicians around 770 BC, which makes it one of the oldest cities in the world. Remains of the city walls from this time are visible in the basement of the Picasso Museum. Nearby, you can see a Roman theatre built in the first century AD, when Malaga was part of the Roman Empire. The theatre lies beneath one of the most impressive sights in historical Malaga; the Alcazaba. This Moorish fortress was built in the 11th century and is the best-preserved building of its kind in Spain. Standing on a hill overlooking the port, the Alcazaba is definitely worth a visit with its towering ramparts, decorative Arab arches and blossoming gardens. Above it lies the Castle of Gibralfaro, a palace built by the Moors connected to the Alcazaba with a walled passageway. Malaga is home to one of the most beautiful churches in Spain, the Malaga Cathedral. Originally a Moorish mosque, the church was reconstructed in 1528 in a Renaissance style. Another church well worth the visit is the Church of Santiago, which has elements of both Christian and Moorish styles following the Reconquest of Spain. Within the historical city centre you will also find the Picasso Museum, which boasts a large collection of the world-famous painter’s work. CAC Malaga offers more modern art and is the most visited museum in Andalusia. Along Malaga´s main shopping street at the heart of Malaga’s historical centre, Calle Marqués de Larios, you will find some of the best shopping in the region. The chic boutiques and designer shops are surrounded by beautiful historical buildings and trendy cafés where you can relax and enjoy the atmosphere.Round your day off with a visit to one of Malaga’s magnificent beaches. Playa de la Malagueta has been awarded a blue flag and is a short 10 minute walk from the Picasso Museum. It may be busy during the summer months, but offers beautiful black sand, great facilities and plenty of beach bars. Other popular beaches are Playa Palo, Playa Huellin and Playa de las Acacias. Calle Marqués de Larios is also a good place to start when looking for a restaurant. Malaga has everything from Michelin ranked restaurants to simple tapas bars and food from all corners of the world, so you are sure to find something to your liking here. When the shops close, you will find hundreds of bars and nightclubs opening around the city centre and offering some of the best nightlife on Costa del Sol. Find information about selected Hotels, apartments and rooms in Malaga to choose the perfect place for your accommodation.